This is it! We’ve reached the end of our countdown! Tomorrow thousands (including these owls) will flock to the desert in Southern California in preparation for the Coachella Music and Arts Festival 2012 which kicks off Friday. Before moving on to our very last artist let’s chat for a minute out our 30 Days to Coachella Countdown. Of course there are those ginormous artists we hold close to our hearts and urge/expect everyone to see: Bon Iver, The Shins, Miike Snow, Explosions In The Sky, Feist, Gotye, Arctic Monkeys, Justice, Florence + The Machine, and Radiohead (duh!) to name a few, but the aim of our countdown was to not only get you pumped (you’re pumped aren’t you?!) but also to highlight some of the artists that you may not have been familiar with but now will hopefully check out too! So there you have it! Go see the big guns but be sure to check out the smaller artists as well! Now on to the final pick for our countdown, M83. 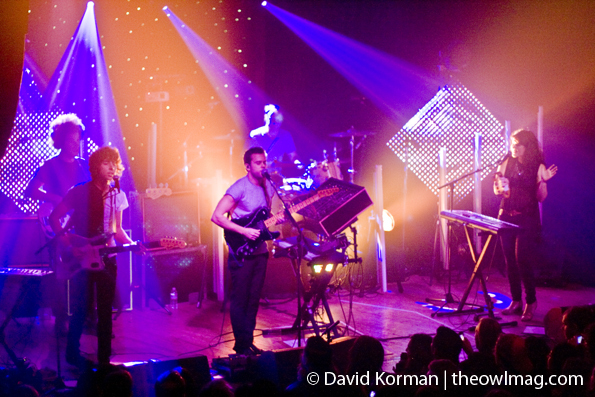 For most Victoria’s Secret Angels come to mind when hearing M83 but for the devout indie music fan and dreampop lover M83’s success is long overdue. The brainchild of Anthony Gonzalez, M83 has been making music since 2001 and this is their second trip to the desert after having huge success with the 2011 release of Hurry Up We’re Dreaming, which made it to #2 on our Best Albums of 2011 list. Considering the video for “Midnight City” has been viewed 8 MILLION times we think it’s safe to say that France’s M83 has made it. Will VS Angels walk on stage when the first notes of “Midnight City” play? We doubt it but that would be pretty sick. Happy Coachella!